There’s no explaining it. I took one look at the tulip border and the sundial stitches that I found while looking for ideas for this cowl, and simply had to use them together. How could I resist? Obviously, I couldn’t. One thing that we need most during cold and dreary winter days is the promise that spring is around the corner with its longer days, sunshine, and flowers. Cowl is worked in the round with seed stitch along both edges to help keep it from curling. There are more rows of seed stitch on the edges of the larger cowl. 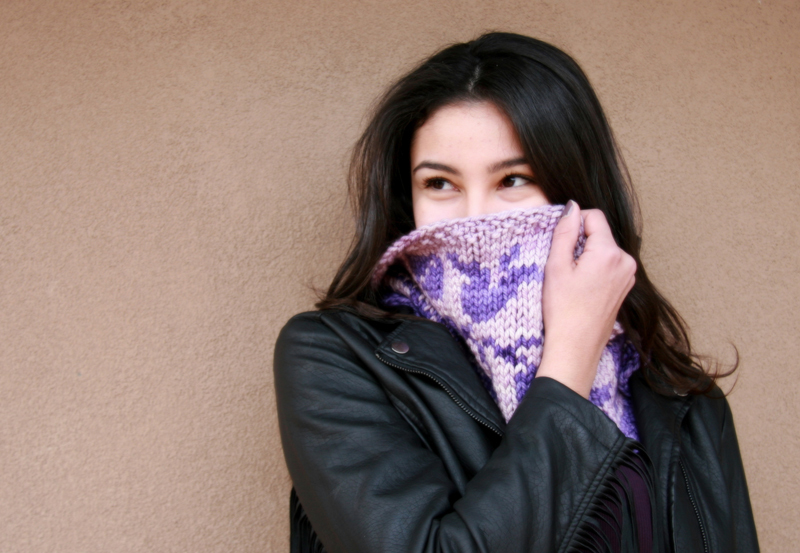 The larger cowl is big enough to pull over the top of your head, and still keep the back of your neck warm. Yarn: bulky weight; 100  yards main color, and 80  yards contrasting color. Model: Anzula Burly; main color: Irene; contrast color: Violet; knit in small size; 100 yards in 4 ounces; 80% superwash merino, 10% cashmere, 10% nylon. Needles: US 13 (9 mm). Gauge: 12 sts and 14 rows to 4 inches in stitch pattern. Finished size: (circumference x height): 34 x 8.25 [34 x 16] inches.